DURHAM – About nine percent of working families with children under the age of six are pushed out of the middle class as a result of their child care expenses, according to new research released by the Carsey School of Public Policy at the University of New Hampshire. The researchers also found that many middle-class families do not pay any out-of-pocket child care expenses, perhaps by relying on family and friends, or by turning to lower-cost, less-qualified care. If all middle-class working families with young children were to pay what typical upper-middle and middle-class families pay for child care, roughly $6,900 per year on average, an additional 21 percent would be pushed below the middle-class threshold. The research was conducted by Marybeth Mattingly, director of research on vulnerable families at Carsey; Robert Hartley, a postdoctoral research scientist with joint appointments at Carsey and the Center on Poverty and Social Policy at Columbia University; and Chris Wimer, co-director of the Center on Poverty and Social Policy at Columbia University. 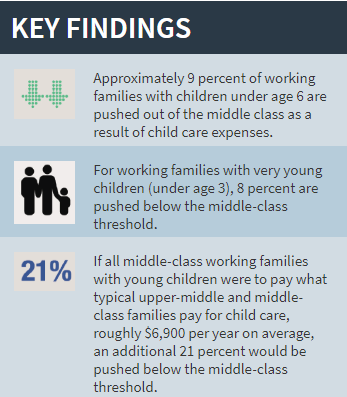 The full report can be found here: https://carsey.unh.edu/publication/childcare-expenses-middle-class-incomes.